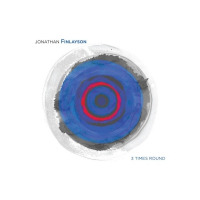 If the title of trumpeter-composer Jonathan Finlayson's sophomore outing doesn't fully express his keenness in balancing conceptual grounding and rigor with fly-to-the-outer-limits expressiveness, the music certainly does. 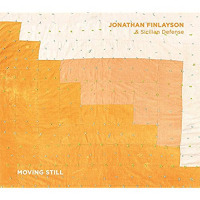 Moving Stillthe highly anticipated follow up to Moment And The Message (Pi Recordings, 2013)finds Finlayson doing what he does best: offsetting intricate lines and latticework with episodes of openness, tweaking thoughts in real time, and slicing through his own architectural creations to penetrating effect. It's a work of grand design and artistic authority, completely in keeping with his debut yet a sizeable step beyond it. The latest incarnation of Sicilian DefenseFinlayson's chess-inspired bandalmost wipes the slate clean in terms of returning personnel. Guitarist Miles Okazaki is the only holdover from Moment And The Message. The newcomerspianist Matt Mitchell, bassist John Hébert, and drummer Craig Weinribbring a fresh viewpoint to Finlayson's canvases without altering his general outlook or compositional voice. All three have plenty of experience treading, swimming, and churning in deep waters, so it's not really surprising that they fit in so well here. All five of these musicians make the most out of these experiences, whether soloing, acting as a cog in the wheel, or throwing an artfully-aimed wrench in the gears. While Finlayson clearly has his own sound, which manifests itself through his horn and his band, there's no one-size-fits-all method to his music. 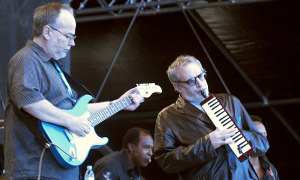 In one instance, an African influenced idea may usher in the slow unfurling of a dark meditation ("Between Moves"); in another, a pure-hearted melody with an unconventional substructure serves as the soloist's guide and leads everybody down a path that ends at a whirlpool of thought and action ("Folk Song"); and in a third, three voices build one moving line, as Finlayson, Okazaki, and Mitchell show their quick reflexes and chemistry ("Flank And Center"). With Jonathan Finlayson, you know that you don't know what you're going to get. That's just part of the magic here. Moving Still is simply astounding. It's action, reaction, deliberation, and impulse rolled into one. Track Listing: All Of The Pieces; Flank And Center; Space And; Cap vs. Nim; Between Moves; Folk Song. 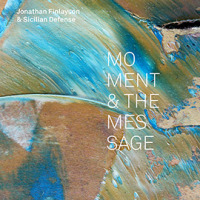 Personnel: Jonathan Finlayson: trumpet; Miles Okazaki: guitar; Matt Mitchell: piano; John Hébert: bass; Craig Weinrib: drums.